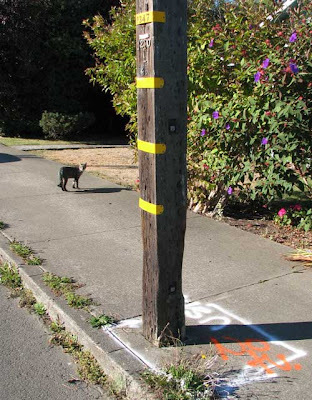 Walking Fort Bragg: Save the Poles? Well, kids, I'm afraid history is moving on. 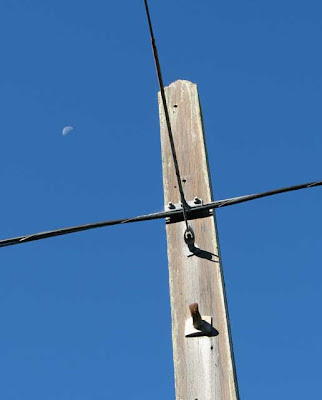 It looks like the two remaining redwood power poles from the days the Union Mill provided electricity to Fort Bragg will soon be gone. 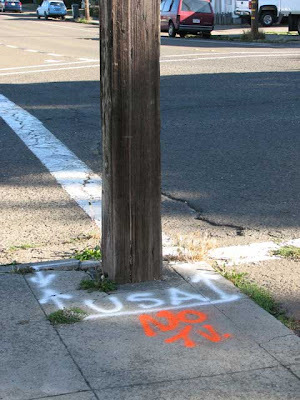 The markings around the base of each pole is ominous. This pole, located 40 paces south from the south-west corner of Laurel Street and Harold Street I admit it is looking the worse for wear. Too much cat scratching? This pole, located on the south-west corner of Laurel and Harrison is in better shape. This is the top of the Harrison Street pole. It isn't carrying much of a load. Hopefully it can be saved. It is on the corner where a minature golf course was located in the 1930's! I have found only three other square redwood poles like these, two at Glass Beach where they were dumped, years ago and the top half of one being used as a clothesline pole near Dana Street! There is a panoramic photo hanging in the Guest House Museum showing poles like these in use on Main Street! The date is 1914!